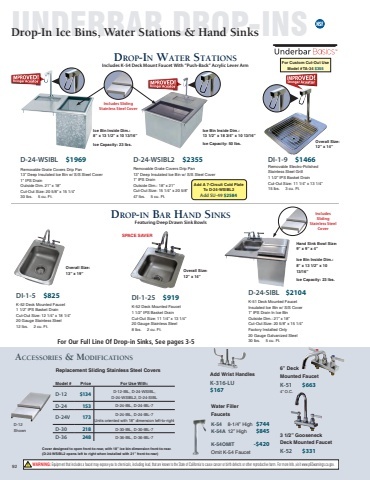 BPassA-ThRru WPorkAstatSionSs &-IcTe BHinsRUS standaRd double sink Pass-thRu WoRkstation With Two Deep Drawn Sink Bowls • 29” working height • Insulated Ice Bin w/ 7-Circuit Cold Plate Sealed Into Bottom Of Ice Bin • Tubing Chase For Soda Gun • Double Tier Speed Rail • 4” O.C. Lead Free Compliant Deck Mounted Swing Spout Faucet • Stainless Steel Welded Cross-Bracing Legs w/ Adjustable Stainless Steel Bullet Feet • 15A - 120V GFI Duplex Outlet Hidden Beneath Shelf • Side Panel Models Include Removable Perforated Top w/ Drain & Front Apron; Units Are Supported By Side Panels & Do Not Require Legs CR-42X36-7-R (Shown with optional Wrist Handles) 36 3 " 8 46 21 " 46 21 " 36 3 " 8 3 46 8 " 36 18 " 46 58 " GFI Duplex Receptacle Hidden Beneath Blender Shelf Model # CR-42X36-7-L or R CR-44x36SP-7-L or R CR-44X36SP-7-L 44" CR-442"X36SP-7-L 44" 44" 42" 1 36 8 " 30" O.A. Price Length Description Ice Capacity Approx. Weight 233 lbs. 425 lbs. Approx. Cu. Ft. 45 68 36 18 " $6365 42” SIDE PANELS WITH PERFORATED DRAINBOARD SHELF 8180 44” Side Panels w/ Perforated Drbd. Shelf 210 lbs. NOTE: To determine left or right hand model, Ice Bin is either Left (L) or Right (R) of the sink from the bartender side. CR-44X36SP-7-R CR-42X36-7-L CR-42X36-7-R FOR ADDITIONAL OVERSHELVES OR GLASS RACKS, START WITH PRESTIGE PASS T 29 3 " 81 8 6 12 " • 29” working height • Insulated Ice Bin15 1 " 4 Pas 3 " 8 12” Deep • Stainless Steel Welded Cross-Braced Legs w/ Adjustable Stainless Steel Bullet Feet 36 3 " 8 • 210 lbs. Ice Bin Capacity • CRPT-2436-7 Includes 7-Circuit Cold Plate Sealed Into The Bottom Of Ice Bin 92 SU-61 Special Sizing to Reduce Length....... N/C WARNING: Equipment that includes a faucet may expose you to chemicals, including lead, that are known to the State of California to cause cancer or birth defects or other reproductive harm. For more Info.,visit www.p65warnings.ca.gov. 15 4 " s- sliding stainless steel coVeR For Pass-Thru Ice Bin SSC-PT $335 For Full Line Of Ice Bin Accessories, See Page 112. 44 58 " thRu ice bin 1 44 1 " 10 12 " 29 1 6 2 " Approx. Weight 80 lbs. 115 lbs. 15 14" 2 29 38 " 15 1 " 448 " 4 36 1 " 8 12" Model # CRPT-2436 CRPT-2436-7 Price $2272 3634 Size W x L x H 36 1/4” x 24” x 29” 36 1/4” x 24” x 29” Approx. Cu. Ft. 13 13 44" Stainless Steel Legs 210 lbs. AdditionAl SizeS AvAilAble For SpeciAlty ice binS. 10 " 8 3 1 29 " HRU WORK STATIONS PAGE 104 30" 12" 42"